Two Canada geese had lots of water to enjoy after the spring runoff filled the low spots along US Highways 83 and 212 west of Gettysburg. 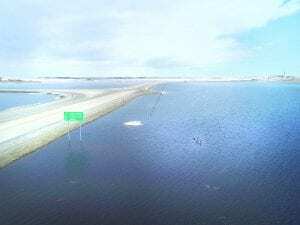 This picture, taken from a drone on March 29, is facing north on US 83 at the six mile corner. More snow this week will keep the area wet for awhile longer. While it may provide some swimming spots for wildlife, it has put spring planting behind schedule for Potter County.